Terri Sandys is a graduate of the University of Puget Sound with a double degree in Music Education and Performance. 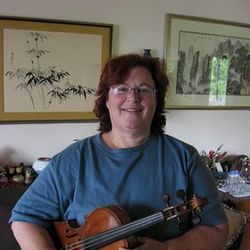 She has been teaching and performing for over 40 years. She has been a member of The Tacoma Symphony, The Spokane Symphony, The Boise Philharmonic, The Yakima Symphony, The Bellevue Philharmonic, and The Seattle Rock Orchestra. She has played for numerous traveling groups and artists, countless musicals, recordings and many other events. She believes in a nurturing approach to teaching that is tailored to the individual student. Andrew holds a Bachelor’s degree in violin from the Wheaton Conservatory in Illinois and a Master’s degree in violin from Cal State Sacramento. Andrew has a life mission of inspiring students to pursue a life long journey of musical fulfillment and hopes to impart to his students his personal passion for violin and the violin repertoire. Weekly lessons focus on performance, posture and technique, scales and exercises, and music theory. He has students perform at least twice a year in recitals and in various community service venues. ​He has three young children under 6 who he is trying to teach music to and enjoys dark coffee and walks on the beach. Currently, she is not accepting new students.